Closer regulation of psychological counselling means that an awareness of the professional, legal and ethical considerations is vital. The second edition of Handbook of Professional and Ethical Practice offers a clear, stimulating, and structured introduction to a number of contemporary issues of professional and ethical practice. Rachel Tribe and Jean Morrissey have brought together updated, re-written and new contributions from professionals in the interrelated fields of psychology, psychotherapy and counselling, which illustrate the professional and ethical dilemmas involved in mental health practice. Academic and clinical experiences are skilfully combined with personal reflection to produce a comprehensive resource that addresses challenges that therapeutic practitioners are faced with on a daily basis. This new, updated edition reflects the changes in the environment in which therapists and psychologists work. 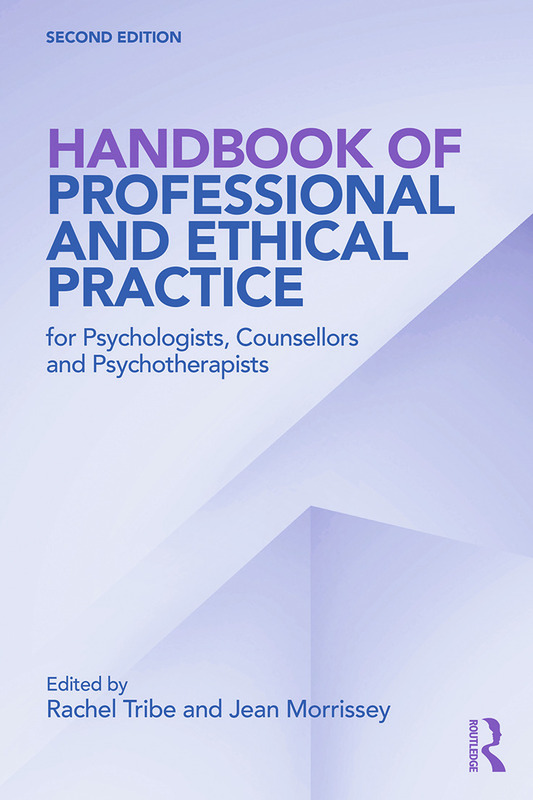 Covering a wide range of perspectives, clinical settings and client populations, Handbook of Professional and Ethical Practice 2nd edition will be an invaluable source of both information and inspiration to psychologists, counsellors, psychotherapists and practitioners of diverse orientations and stages of professional development and to those interested in a contemporary, multi-disciplinary approach to best practice in mental health. Part I: Professional Practice and Ethical Considerations. Tribe, Morrissey, Introduction. Bond, New Challenges For Professional Ethics and Good Practice Guidelines For Counsellors Psychotherapists and Psychologists. Carroll, Psychological Contracts: Hidden Agreements in Life and at Work. Cross, Wood, The Person in Ethical Decision-Making: Living with Our Choices. Part II: Legal Considerations and Responsibilities. Jenkins, Client Confidentiality and Data Protection. Jenkins, The Legal Context of Therapy. Winthrop, Writing a Report for use in Court and Appearing in Court as a Health Professional and / or Expert Witness. Purves, The Ethics and Responsibilities of Record Keeping and Note Taking. Part III: Clinical Considerations and Responsibilities. Haworth, Gallagher, Referrals: Clinical Considerations and Responsibilities. Gallagher, Haworth, Professional and Ethical Issues. Barden, Caleb, Fitness to Practise. Lane, Boden, Self-Harm and Suicide Risk: Identifying Some of the Professional and Ethical Considerations. Evans, Bor, Working in a Health Care Setting: Professional and Ethical Challenges. Creaner, The Role of Social Media in Counselling and Psychotherapy. Part IV: Working With Diversity – Professional Practice and Ethical Considerations. Newland, Patel, Senapati, Professional and Ethical Practice in a Multi-Ethnic Society. O’Donnell, Gersch, Professional and Ethical Issues When Working with Children and Adolescents - An Educational Psychology Perspective. Huq, McIntosh, Professional and Ethical Issues in Working with Older Adults. Rees, Working with Lesbian, Gay, Bisexual and Transgender People. Forster, Tribe, Professional and Ethical Issues When Working With Learning Disabled Clients. Part V: Research Supervision and Training. Olsen, Jordan, Research in Therapeutic Practice Settings: Ethical Considerations. Gannon, Evidence-Based Practice - the Ethical Dimension. Grimmer, Personal Therapy For Therapists: Professional and Ethical Issues. Castro, Teaching Ethics for Professional Practice. Morrissey, Training Supervision: Professional and Ethical Considerations. Tribe, Trainee Perspectives on Professional and Ethical Practice. Hadjiosif, Professional and Ethical Practice During Training: The ‘Wounded Healer’. Morrissey, Clinical Vignettes and Reflective Questions. Rachel Tribe is a Fellow of the British Psychological Society (BPS) and the RSA. She is an HCPC registered Counselling and Occupational Psychologist. She won the BPS Ethics Committee’s 2013 Award for Challenging Social Inequalities in Psychology. She is an active clinician and researcher and is involved in international consultancy and training work. She is professor at the University of East London. Jean Morrissey is Lecturer in mental health nursing at Trinity College, University of Dublin. She is an accredited psychotherapist and clinical supervisor with IACP. She is an active clinician, supervisor and researcher and is currently completing her PhD in the area of suicidology at Trinity College Dublin.